Hello, August! Can you believe we’re already wrapping up summer? My older 3 boys just started back to school and I am anxious to get back on a schedule and back to an easy to follow routine to help keep my life and home in order. To kick start the transition to back to school, I’ve been plotting and planning little daily challenges to help me stay on track with the things that are important in my life. With these day-of-the-week themes, I created a calendar with a simple daily task to challenge you, and me! Because let’s face it, I need some external accountability most of the time. I wanted a simple daily task that would, for the most part, take less than 15 minutes. This excludes Monday’s when I do the majority of my household cleaning. That day didn’t need any extra tasks. So how do you join in on the challenge? You can print a copy of the August calendar and put it somewhere easy to spot. You can adjust any challenges, as may be needed, to fit your own life and family situations. I’ll be sharing the daily challenge on my Facebook.com/amomstake and Instagram @amomstake accounts. Follow along with me there to share your own successes, failures, and pleas for that extra ounce of motivation we sometimes need. 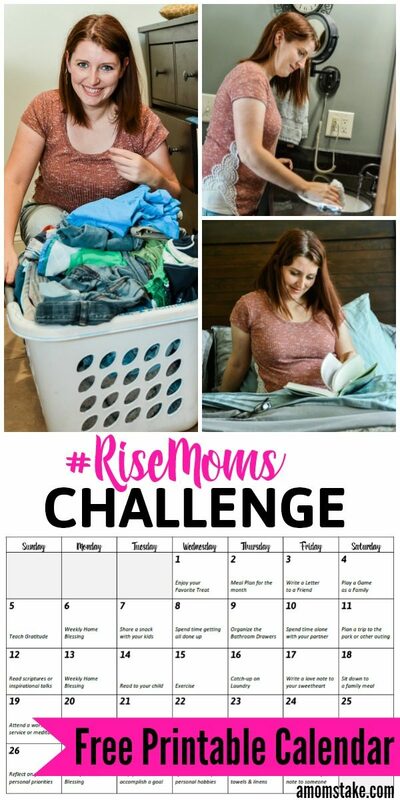 I’ve dubbed this challenge #RISEMOMS as it’s all about the little things that can lift us up, and help us feel accomplished in the sometimes rut of motherhood. I’m also aiming to finish the tasks early in the morning, to help set the tone for the rest of the day! Little things add up, and they can really make a difference, so join with me this month (and look for my September calendar to follow). 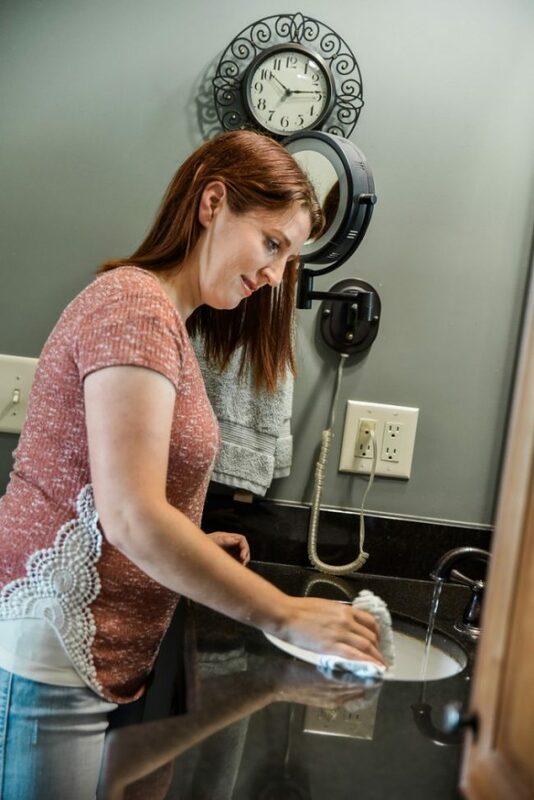 I can’t wait to see how these little challenges help your home and personal lives. Meal plan for the month —> Need dinner ideas? Grab this printable! Spend time getting all done up —> See my 5 minute make-up routine! And that’s it for august! Be sure to check back next month for our next monthly challenge calendar. Remember to just do what you can, and count that as a success! 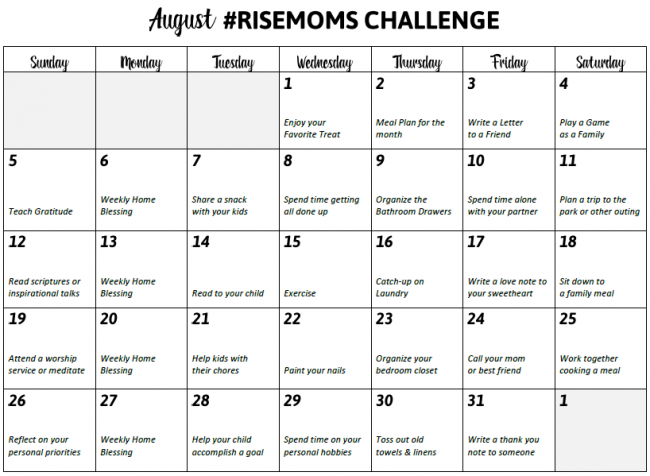 Just click the link or image below to save or print a copy of the August monthly challenge calendar. Have ideas for future month’s challenges? Leave them in the comments. I’d love to add in readers ideas into the challenge!! I can’t stress enough the importance of organizing stuff…starting with stuff, soon enough you’ll find out you got your whole life decluttered…will share your calendar with my wife. I’m sure she’s gonna love it! I’m always telling my wife to take more time for herself. Showing her this so maybe she can finally implement some ideas! I’m in love with your focus! You’ve developed a great plan that’s a healthy way to focus on all things important. I’m liking the day of the week themes a lot. It is crazy how much my schedule has changed since school started back up. Trying to get into the groove again. I love this challenge idea! It is so important to stay focused on the positive and on our priorities. Printing the calendar now! What a wonderful challenge idea! Life can often seem overwhelming, especially as a busy mom. This calendar is a great way to help keep important things in perspective.